In Dusseldorf this morning, caught out by a brief but heavy shower I sped around the corner to a great little camera shop to look for a few bits. 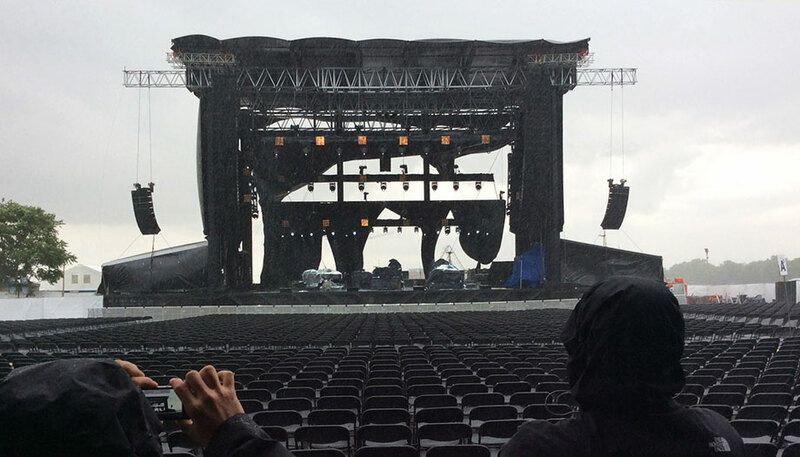 I didn’t think to check the weather for the outdoor show in Mainz this evening. Our hotel checkout was scheduled for 2pm and we exited the area in stealth mode, in the VW’s via the underground car park so as not to disturb a congregation of rather eager ACDC fans and assorted MKDS stragglers. Brian Johnson and co. were in the hotel and our two bands shared more than a few laughs in the hotel bar last night. Brian is a top man with a wicked sense of humour (like most Geordies) and ACDC are a phenomenon, still selling out huge shows worldwide. The band’s mutual hearing damage testament to the sheer volume on their stage, casual conversation with them was slow and further enhanced my opinions of in-ear monitoring. We approached the main railway terminal and it was still raining as we found platform 16 and awaited our train to Mainz. Mainz is so named as the river Main which flows through Frankfurt joins up with the mighty Rhine and this location. Our venue was sited right next to the river in a very exposed spot. 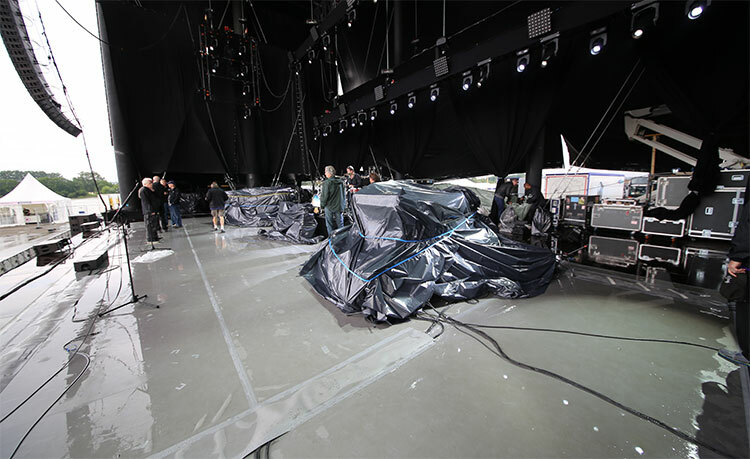 As we approached Mainz station, we received a message from our production manager that the stage had been hit by a huge squall shower with high winds resulting in a stage evacuation as the huge plastic sheet at the rear of the structure was blown horizontally with long alloy pipes designed to keep the thing vertical were thrown out violently into the backstage area. Thankfully no-one was hurt but the equipment which was uncovered at the time got severely wet. 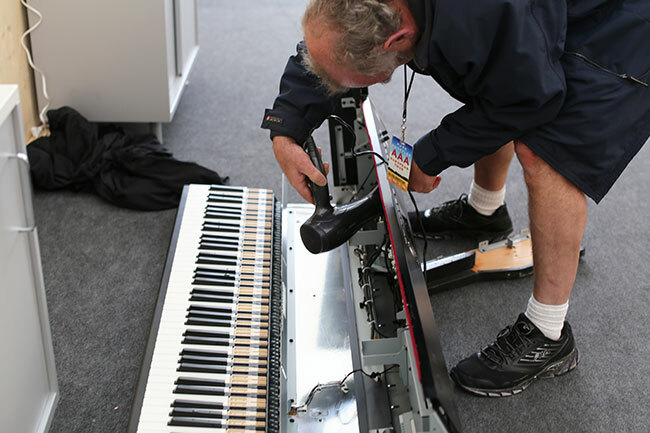 Water does not mix well with electronics and the first casualty was Jim’s piano which Laurence removed from its shell and took backstage with a view to running it under the hairdryer for a while. Once, that is they managed to get hold of some hairdryers. Colin asked me if I knew where they were kept and I replied “we’re not really a ‘hair dryer’ band”. The runner ended up going out and buying some. 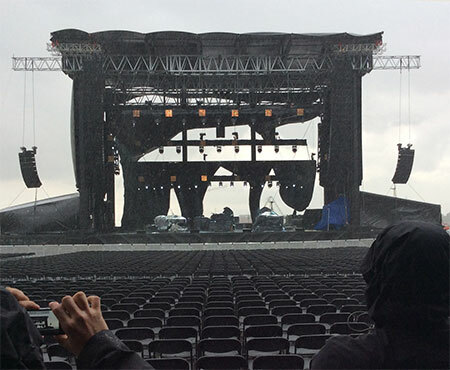 The stage like we’ve never seen it…. 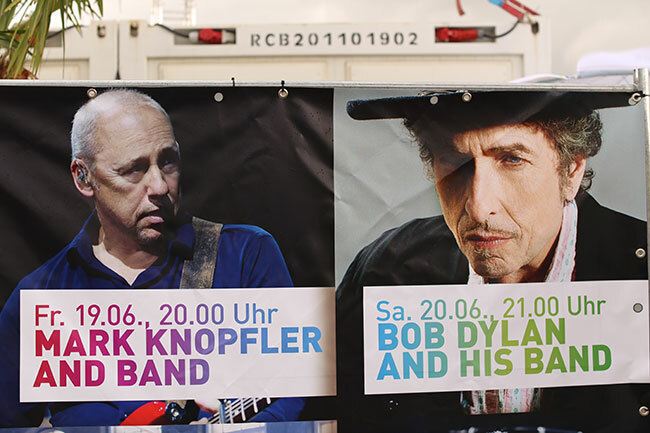 It was a lovely surprise to see most of Bob Dylan’s production and crew appear backstage. 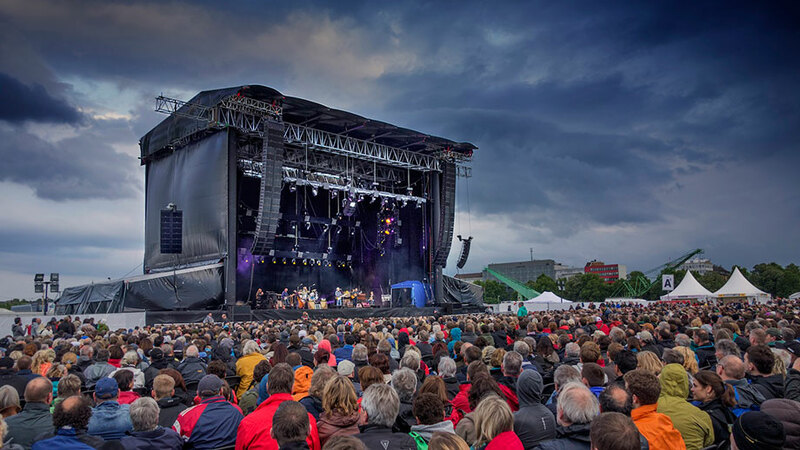 They are playing this venue tomorrow, in hopefully slightly better weather. Seeing them again reminded us of what a great bunch of guys they are, it was lovely to catch up. It wasn’t until 45 minutes to showtime before the covers came off the keyboards and amps as the weather wasn’t scheduled to abate until such time. This caused me some internal anxiety although faith in our intrepid back-line crew is extreme. Sure enough, there was only a slight delay, just two items failing to fire up. My mixing desk (spare deployed) and Jim’s Leslie speaker (spare deployed). Rarely do bands carry so many spare instruments. We do for this very reason! There was also some discussion about the set length as this venue imposes a strict 10pm curfew and our set currently runs at 2 hours. We did have to knock a couple of songs out of the set but I don’t think anyone minded too much, the audience seemed to really appreciate the whole show and we left to rapturous applause and sped off in the VW fleet, Frankfurt-bound. It was only 10:45 when we arrived at the Villa Kennedy so everyone convened in one of our favourite bars for a few drinks. We toasted our crew….whose valiant efforts today ensured the show took place at all.